The biggest impediment to skiing is cost: the gear can be prohibitively expensive, and that’s before you get to lift tickets. The good news is that despite all the hype around the latest and greatest gear, you can have a good day on the hill without breaking the bank. It’s true: a $700 jacket is nice but won’t necessarily make you ski any better. At the same time, you don’t want to invest in something that won’t last, which we definitely took into consideration when putting together our picks. Below is our “Good Ski Gear on a Budget” for the 2018-2019 season, including ski jackets, pants, gloves, goggles, helmets, baselayers, and even socks. The total price at the time of publication: a cheap $366 to get you fully kitted out (sale prices at time of publication in men's size medium). Your ski jacket is a critical barrier from outside moisture, cold, and wind. Instead of buying a separate shell jacket and midlayer, which drives up the cost, we think the best way to save money is with a 3-in-1 system (a jacket with a zip-in midlayer included). A bonus is that each piece can be worn on its own in mild conditions or for other applications. 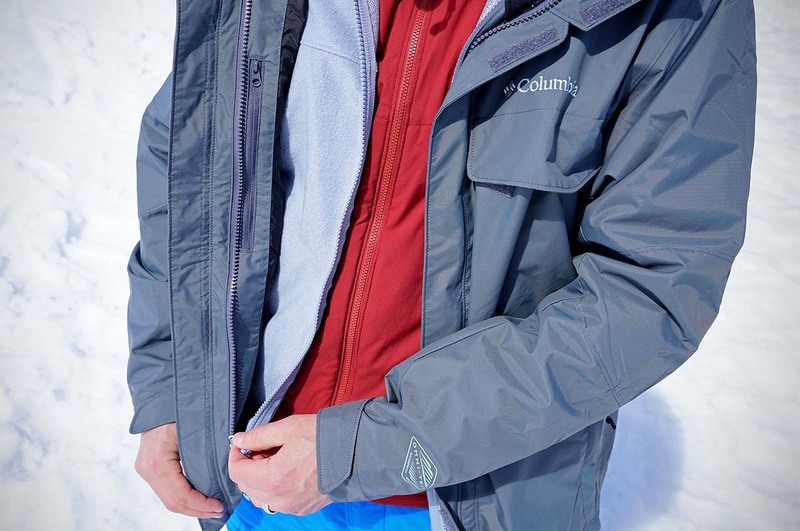 Our favorite 3-in-1 ski jacket is the affordable Columbia Bugaboo Interchange II at $175, although at the time of publication we were able to find it as low as $135. The Bugaboo is a proven design that repels moisture with its waterproof shell, has a tough construction, and is made in a range of color options and sizes. The downsides are that the fit is a bit bulky, you don’t get pit zips for dumping heat, and the fleece jacket is very basic, but paired with a decent baselayer it should be comfortable and warm for most days on the hill. And on spring days, you can leave the fleece behind. All told, we think the Bugaboo is the best budget ski jacket on the market. For a complete list of options, see our article on the best ski jackets. 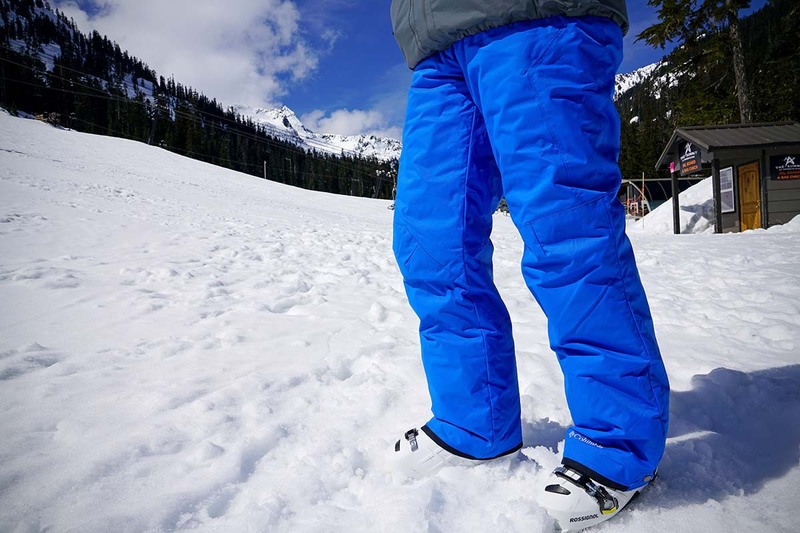 All most people need in a ski pant is dependable waterproofing, a durable build, and decent comfort. The fancy 3-layer designs, lightweight constructions, and stretchy softshell fabrics are nice but cost hundreds of dollars more. To be honest, they aren’t all that necessary for casual days at the resort. A burly pant that doesn’t get in your way will do the trick, and again we turn to Columbia for that combination of price and performance. The Bugaboo II ski pants are waterproof, should last a long time, and cost well under $100. Keep in mind that these are lightly insulated so you can get away with a thin baselayer on warm days. For more options, see the best ski pants. If you stick to groomed runs and ski when the visibility is decent, a ski goggle is an area where you can save a lot. High-end goggles can cost well over $200, but our favorite value pick is the Bolle Mojo, which is a far more wallet-friendly $25 MSRP (and typically around $16-$20 online). You skip the high-end triple foam padding and these goggles may not last for more than a few seasons, but the price is right and they should do the trick for beginners and weekend warriors. It’s worth nothing that the optics are on the dull side, so you’ll want to choose a middle-of-the-road lens color like the Vermillion or Citrus for mixed conditions. Aggressive or off-piste skiers may want to upgrade to the Smith Scope, which will cost you another $30 to $40 for a mirrored and crisper lens. The improved clarity is important in potentially dicey or unpredictable terrain. But for cruising, there’s a sweet simplicity about the Bolle Mojo that just works. For a full list of options, see our article on the best ski goggles. Comfort plays a big role with helmets. The cheapest of the cheap can be uncomfortable with flimsy foam, little to no adjustability, and poor ventilation. To avoid these pitfalls, we recommend the Smith Holt ($70 MSRP). Smith is our favorite helmet brand and their Holt is reasonably affordable and a good example of smart savings. It has a comfortable and creative adjustable fit system (without having to resort to a more expensive twist dial) and the design manages to avoid that massive look and bulky feel typically associated with entry-level helmets. The padding also provides good all-day comfort and it has decent ventilation to keep you from overheating. For more options, see the best ski helmets. Outside of an uncomfortable boot, ski gloves are the fastest way to ruin an otherwise glorious ski day. This doesn’t mean spending a lot, however, as our top budget choice is the $65 Gordini GTX Storm Tropper II. These gloves are comfortable in most temperatures and have a Gore-Tex insert for full waterproofing. There’s also a handy zippered pocket along the back of the hand for sliding in a hand warmer. 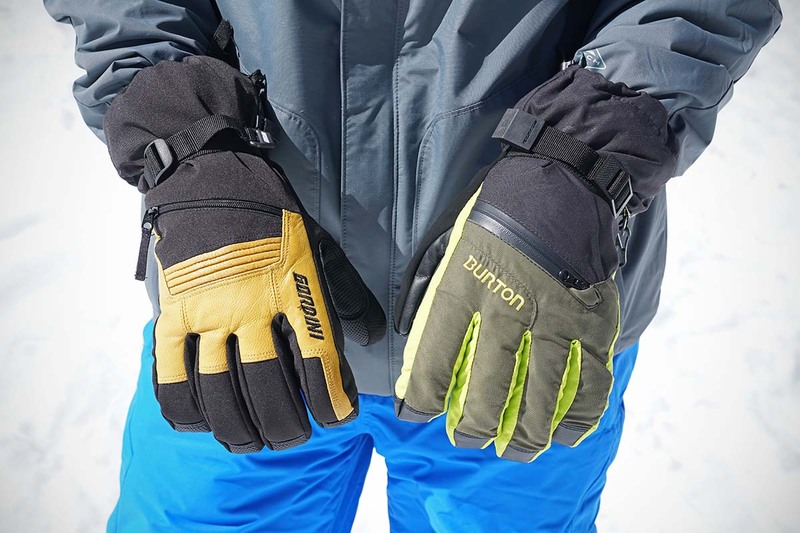 It’s the type of glove that can be worn most days of the season, but the lack of a removable liner can be issue on warm spring days (the slightly more expensive Burton Gore-Tex gloves do have a removable liner). If you’re really about going as cheap as possible, the leather gloves like Kincos are the classic budget option for resort employees, but they’re not warm enough for us to recommend here. For all of our top picks, see our article on the best ski gloves. Staying comfortable while skiing requires a well-tuned system of layers, and the primary driver of comfort is your next-to-skin baselayer. You can go cheap here with a traditional cotton thermal but we recommend against that. If you work up a sweat, the cotton won’t draw the moisture away and you’ll be cold, wet, and potentially miserable. Instead, stepping up to a moisture wicking and quick drying synthetic is the better choice. For these reasons, we like the Helly Hansen Lifa Stripe top and Dry Fly bottom at the budget end. At $80 for the pair, you get good comfort and performance all day long. It’s true that merino wool will prevent stink better, but you’ll spend a lot more for the privilege. For more on this category, see our round-up of the best baselayers. Thanks to improvements in ski boot design, you no longer need a thick and super warm ski sock. Instead, just make sure you socks are tall enough to clear the top of the boot and won’t bunch up. And as with baselayers, try to avoid cotton. Our top budget ski sock the wool blend Wigwam Snow Sirocco. At $15 retail (again, it’s often on sale for a couple bucks less), it fits well and you won’t give it a second thought throughout the day. More expensive socks are made with merino wool (the Sirocco uses standard wool in its blend), and they’re worth the extra investment if you’ll value their superior temperature regulation and stink prevention. 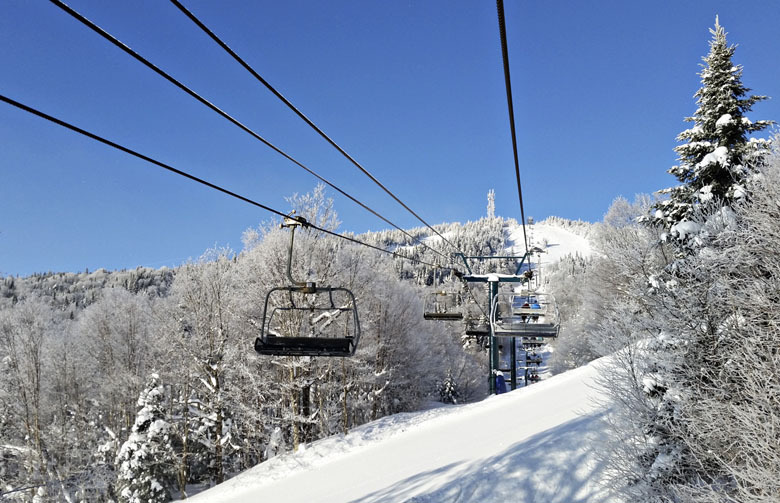 But most skiers can handle the slight downgrade and save about 50% in the process. For more, see our article on the best ski socks. For the entire set-up above at full MSRP, you’re looking at about $525. And with the sale prices we found upon publishing this article, it’s only $366 total (we searched in men’s size medium and mostly on Amazon). For some perspective, that’s considerably cheaper than just one high-end, uninsulated ski shell like the Patagonia PowSlayer at $699, and you’ll likely have just as good of a time on the slopes. Boom: that’s great ski gear on a budget. Even more than ski apparel and accessories, there is an emphasis on having this year’s version of skis and boots. And barring some big change in ski design—which happens every five years or so—all you’re likely getting with the newest model is a change in graphics and maybe a modest improvement in construction. Sometimes it’s literally the exact same ski or boot with a different paint job. As such, try to buy early (or late) in the season to get last year’s stuff at big discounts. No matter the time of year, we’ve found Evo.com's ski sales page to be one of the best at selling ski gear at discounts. It often has hundreds of skis, boots, and bindings. Another option, and particularly for beginner skiers, is the Skis.com sale page. For those looking for the entire set-up, you can save with a ski package that includes skis, bindings, and sometimes boots. Skis.com has a number of pre-built ski packages ranging from beginner all-mountain gear to advanced-level models. Evo.com’s ski packages don’t typically include boots, but are another way of getting a good discount on current models. The products listed above are not the absolute cheapest on the market. We’ve been intentional about recommending gear that will keep you comfortable and last. And an important distinction is that even with a budget setup, you want the “system” of gear to be working. For apparel, your ski outerwear should keep you dry and your gloves should keep you warm. Your helmet should be comfortable enough that it’s not a huge impediment to your day. Having a missing link in the system can make for an uncomfortable experience, even when conditions aren’t all that bad (for example, don’t spoil the baselayer by wearing a cheap cotton shirt). But as we’ve shown above, a well-thought-out setup can be both affordable and offer decent overall performance.